A couple of mornings ago, Hughie the MD walked up to my desk holding up a copy of the new S 65 SXF brochure. When he reached my desk he opened it up to the back page and showed me the photo I took of the machine at Wembley filling up the inner back cover! It was a decent surprise and gave a me a laugh. It was nice to see another of my shots being used in a brochure! 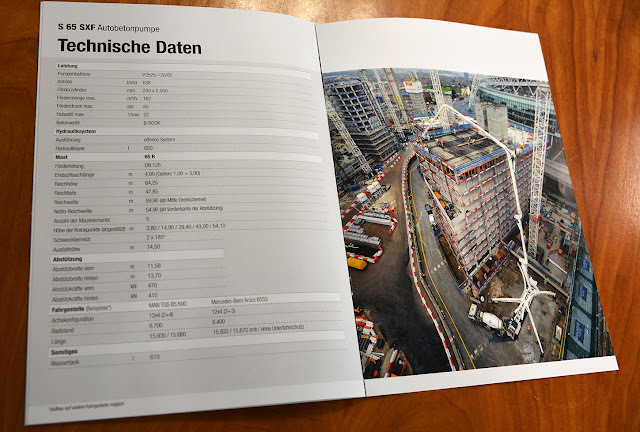 This was the German version, for readers interested in a new S 65 SXF concrete pump, we should have brochures in English very soon! Unveiling the new Schwing S 65 SXF! The first of these incredible machines has become the property of London Concrete Pumping. 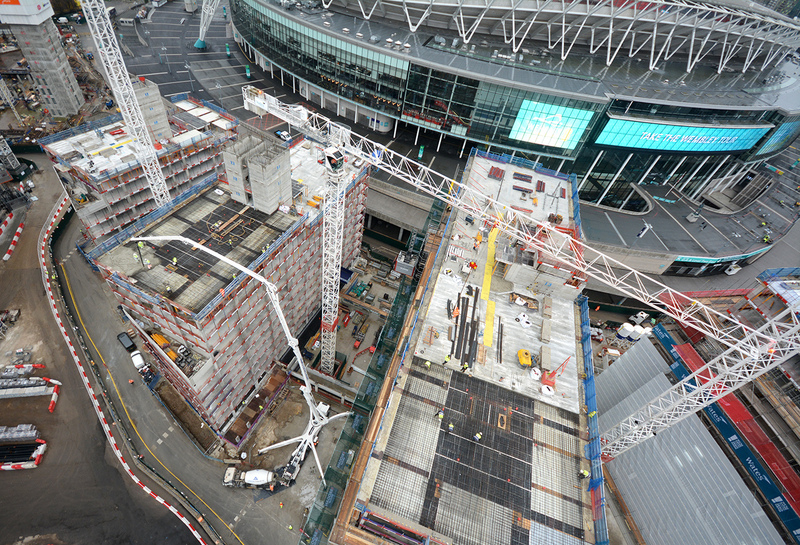 It's first job was on the new Wembley Park development and I was fortunate enough to be offered a chance to visit the site and take some pictures from a cage suspended from a crane. As you can see they came out rather well! The best ones were taken with my 10mm wide angle lens which allowed me to get a good portion of Wembley Stadium in the background too (which does give a good comparison of size)! 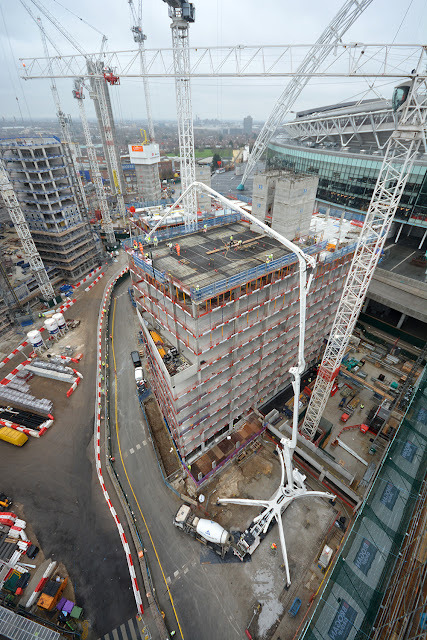 With a vertical reach of just under 65 metres you can see this beast of a machine easily reaches to pour the slab at the back of the 11th floor. It shouldn't have too much trouble with 12 or 13 either. This is only the seventh S 65 SXF so far produced in the world and is the actual machine featured being built in the promotional video below. 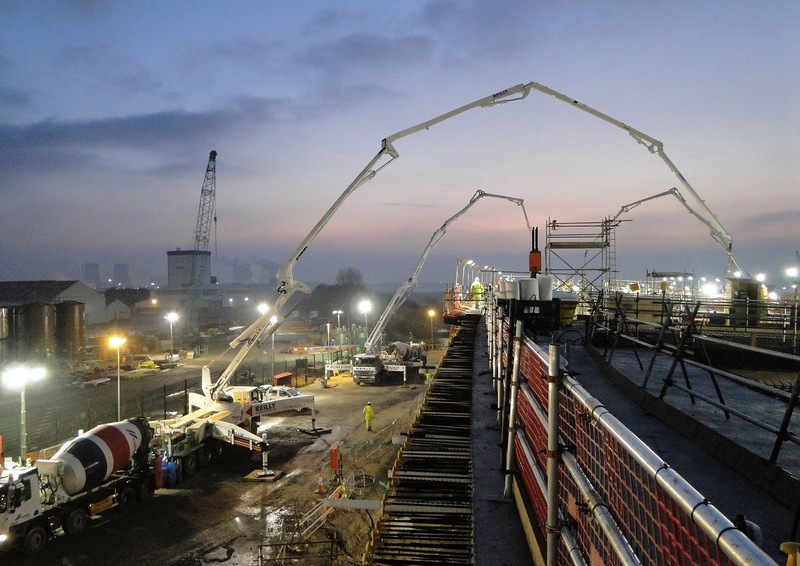 Earlier in the year we sold our first Stetter Batching Plant in the UK to Total Concrete in Woking. To help document the occasion we set up a time-lapse camera on site for three months. What was interesting to see so clearly was the main visible work of erecting the plant itself only took a week. Much more time was spend before hand on preparation and ground work, and then afterwards on connecting, testing etc. 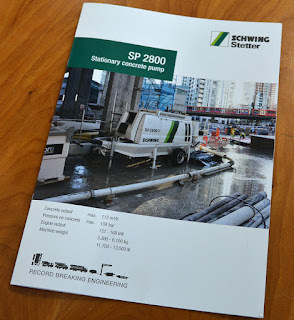 The plant produced it's first commercial batch in May and is continuing to function well (as you'd expect), and the guys at Total are really happy with the quality and service provided by Schwing Stetter UK. Everyone happy! A few months back I was invited by James Harding at Hardcrete to take some video footage of a day's pour in Chorleywood. 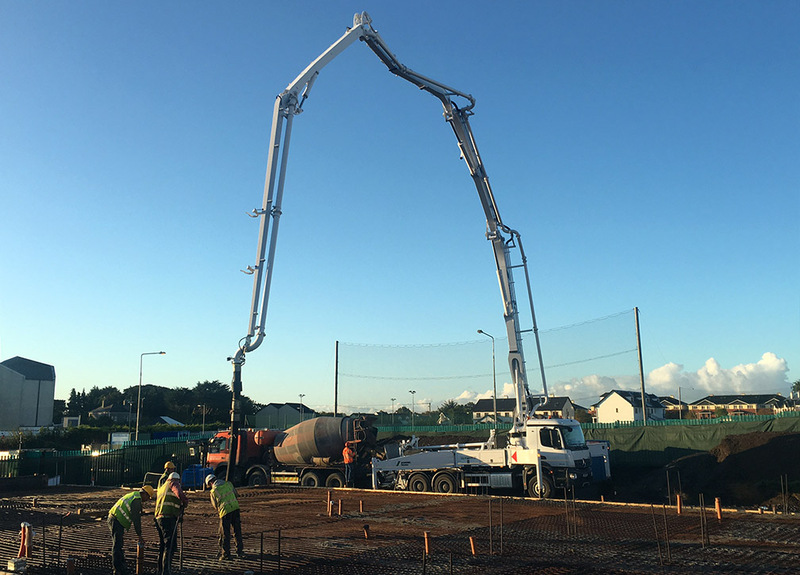 They had recently bought a new Schwing S20 mobile pump and were happy to allow me to film for the day while they poured the 150 cubic metre concrete foundation for a new home. We particularly wanted to show the main feature of the new S20 in that it could set up without extending outriggers beyond the edge of the vehicle itself, demonstrating that the machine could set up in very tight locations - a good thing for working in cities and towns in particular. While I was there everyone working on the project was happy to say how pleased they were with the new Schwing machine - which is always great to hear. A few months back our colleagues in Germany were putting together a new brochure for the latest SP 2800 static pump and asked me if I could provide a photo. This meant tracking down a 2800 machine we had recently sold that was working on a site not too far away and that I could get on site to get some photos. Thankfully such an opportunity existed over near Canary Wharf. Unlike mobile boom pumps which can make for wonderful shots because of the boom arched majestically against a skyline, static pumps don't naturally lend themselves to looking good in pictures. They are typically hidden away in a dismal corner out of the way which makes it even more difficult to get a flattering photograph. 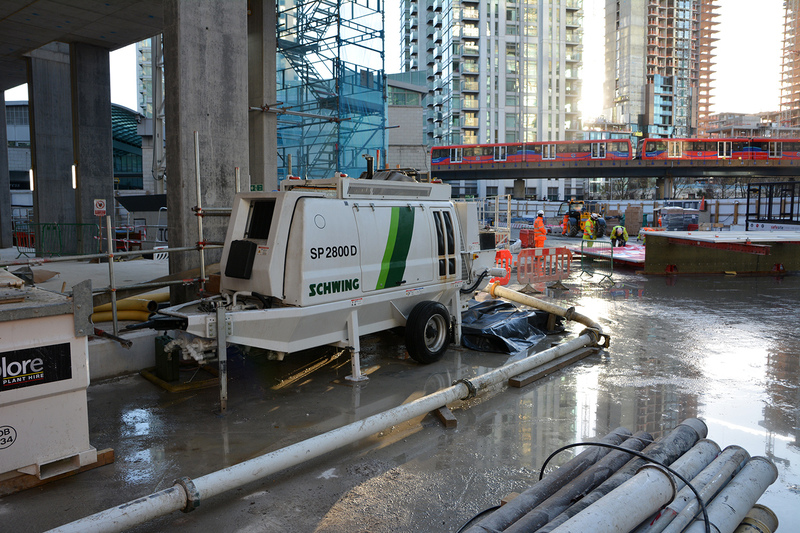 However as luck would have it, this one had a backdrop which included a raised railway line (the DLR), some buildings and if I waited for the right moment, the sun between the buildings which would reflect in the water on the ground near the pump. The Germans were very happy with the result and as you can see, used one of my shots on the front cover of the new brochure, which arrived here at the office a few weeks later! I got a nice surprise the other day. 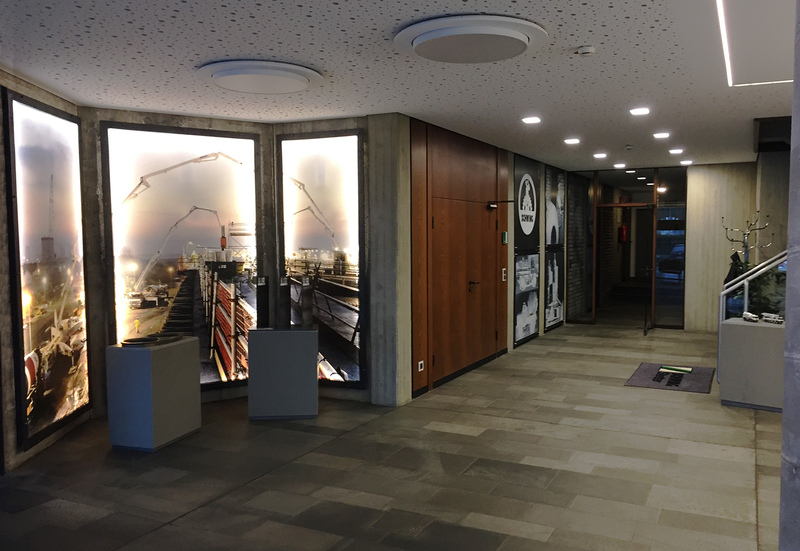 Hughie, our UK MD had just come back from head office in Germany and showed me a picture of their new reception. 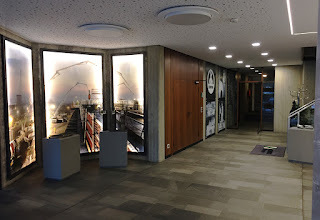 The main feature in that new reception is a three panel image consisting of one my photos! 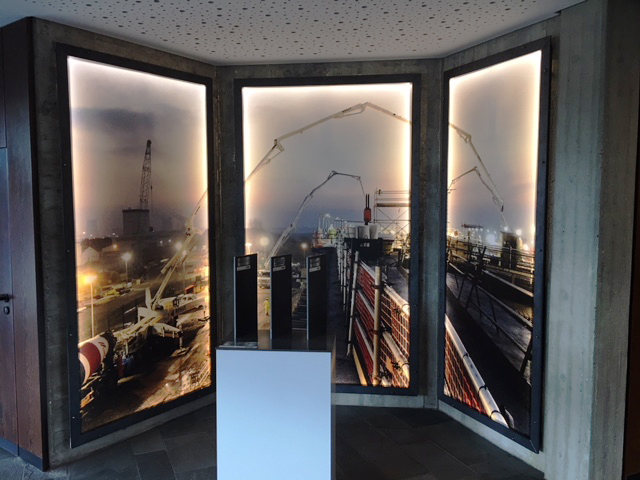 It was the one I took of the Reilly's job at Merseylink, which also featured in this year's calendar and also a jigsaw puzzle! Who'd have guessed when I took that photo it would become so enduring! There may not be any snakes in Ireland but there is certainly now one Reptor! Scott, our chief engineer was down in Oranmore (near Galway) yesterday commissioning a new S 38 SX Reptor for its new owners. They began the pour at 7am and had finished pouring the 200m3 by 1pm with every load going straight through - as you'd expect from a new Schwing. Now is it off to celebrate with a Guinness or a Jameson's? To keep up to date with our latest blog posts follow us on Twitter or on Facebook.